While I was away last week, Canada lost four more soldiers in Afghanistan. I was working long hours, and did not have much time to read the papers or listen to the news. I was aware of the deaths, but I am ashamed to say they did not register with the usual heart wrench I feel at such news. Today it registered, hard, and I cried for the senseless loss of those four young soldiers. And for the men and one woman that have already died in this Canadian mission. It was a video I saw for the first time on Rositta's blog that hit me. Now, I don't normally get political on this blog, other than to occasionally curse politicians or bureaucracy, but that's just sport. And I am not really going to get political now. But I will say that I do not support Canada's mission in Afghanistan. It is a combat role, not the traditional peacekeeping role of which Canadians can be so proud. And more importantly, I don't believe combat can solve the complex situation in Afghanistan. I don't pretend to have the answers to solve the strife in that country, although if you have an hour or two and would like to discuss it with me I have plenty of ideas and opinions. What made me cry were images of the soldiers coming home on the Highway of Heroes. For those who are not Canadian, let me explain. The bodies of dead soldiers from Afghanistan arrive home by plane at the Armed Forces base at Trenton Ontario. There, they are met by their families, dignitaries and government officials. From Trenton their hearses travel 170 km. to the coroner's office in Toronto, accompanied by their families in limousines. The route is closed to all other traffic as they pass. 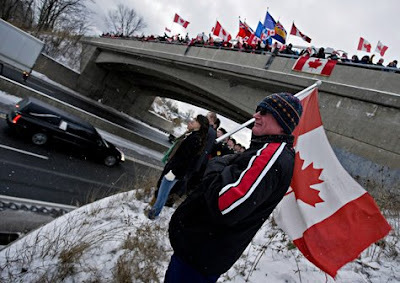 As soldiers began making that last journey along highway 401 a few years ago, more and more people started to gather along the highway and overpasses to show pride, respect, and sorrow for the fallen, and support for their families. Local police and firefighters joined in. Now, virtually the whole route, which takes an hour and a half to drive, is lined by people saluting, waving flags, crying, or waving in tribute. I am proud that, despite the fact that there is little support in Canada for our continued combat presence in Afghanistan, we do not hold it against our soldiers. They deserve only our respect. And I hope the journey along the Highway of Heroes (now officially named) gives the devastated families some comfort, in knowing that they are not alone in grieving their sons' (and one daughter's) sacrifice. Here is the video. The Ontario Provincial Police created this tribute, and it is the OPP "Voices in Blue" that sings in it. Maybe the fact that I have a 22 year old son makes this more poignant for me. But I bet you too will not have dry eyes by the end, no matter how you feel about the war in Afghanistan. This is so very moving. Whatever the rights and wrongs of a conflict, it is right that these brave soldiers should be so honoured. Canada certainly shows the way all nations should pay tribute to ordinary people who lay down their lives for others. We lost a few of our own during the month. We should never have entered Iraq, we should've always kept our focus on Afghanistan. I am always so torn about this. I do not hold bad wars against teh soldiers and yet I feel so strongly about engagement in war (as opposed, as you mentioned, peace-keeping missions) that I ususally just don't enageg in any way. It's a sorrowful thing all the way around. This was a very touching post. Quite a few of the losses have been suffered by people from my state and it makes me so sad every time I hear of one. I remember when Bill and I went on a canoe trip in the mountains a few years back. The young man who was working there and got our canoe to the launch place and picked it us up at the end told us he had joined the army. His reasons seemed to be largely financial. He had lost a construction job and felt like he would learn a new trade in the army and then when he got out his prospects of work would be better. It made me so sad to think that he might not come back. He was nervous but optimistic. He really touched me. I am against our presence in Afghanistan, but never ever against the soldiers. I can't imagine how hard it must be, being there knowing your mission has little support at home. At the same time, what can you do? Leave there and have the life of Afghans return to what it was under the taliban? Though to be fair, it's back to that in most of the country. When I look at how we treat each other and the planet, I can't help but think humanity is essentially evil. And it's always the low man on the totem pole who pays. Always. I think I should go now before I start ranting. Powerful message, my friend. I suppose my biggest question about Afghanistan is why we are even there. It's unwinnable. The Russians found that out 20 years ago. And that all registers the deaths senseless and that compounds the tragedy. I live in a military town and have neighbors who are doing the euphemistically titled 'tours.' Thank you for this. Moving and poignant. Oh, yes. I love how you note that support of troops and opposition to war can go hand in hand. DD, You're right they are ordinary people. I think they become extraordinary just by virtue of the reality those soldiers face every day. Orhan, Thank goodness Canada refused to back Bush and participate in Iraq. Citizen, Yes, it's sorrowful. And senseless. And I bet most of the young men and women over there had no idea what they were in for. Carver, The army attracts many people who join out of desperation, for work, for training, or just for three squares and a roof. And it's usually the lowest ranks in the most danger. I hope your young canoeing friend is safe. Jazz, I think we could have a good rant together some time about the uselessness of trying to change hundreds of years of Afghanistan history in a few years of forcing our values on them. Ian, "Tour" indeed. For too many it's a one way tour. Jocelyn, Yes, we have come a long way since Viet Nam, when society too often took its hatred of war out on the returning soldiers. Rositta,Thanks for introducing me to that video which was the inspiration for my post. It even made my husband cry! As for your grandson, I don't know how old he is, but perhaps his army talk is just a phase. At about age 12 my son talked about joining the armed forces, but it did not last long. Terrified me for a while though. Big Brother, Politicians make many decisions that affect a segment of society they are not part of. But in this case they are sending young men and women into a deatly situation for no good reason. It's appalling. Some amazing images there, especially the girl with the flag in the vehicle. We too, have been touched by loss in Australia. thank you for sharing this with us. it says much when people come together in such unity of support for those lost and their families regardless of how they feel about the conditions leading to that loss. This is such an amazing and touching post. The pictures are so moving, especially the one of the little girl. I came over from David's blog. Congratulations on the POTD - well deserved. I came over from David's authorblog too. Congratulations on the POTD. Very, very moving and an important message to get across. Thank you very much. David, Thank you for the inclusion in your POTD. (For those of you don't know what a POTD is, head over to David McMahon's authorblog from his comment below. You wil find some great reading in addition to learning about his POTD.) I am going to look for Vegemite Vindaloo, I hope it is available here. The book, not the dish. Lime, Thanks for dropping in. By the way, you have the coolest graphic in your blog's "about me" section. Cheffie, The photos are very moving. I would like to stand on the Highway of Heroes with the crowds one day, but that would mean we have lost another soldier, so I hope I never get the chance. Denise, Welcome to this little corner of blog land. You are welcome back any time. I reply to your question on my blog, I fell in love with Muskoka in late 2005, on a photography/ travel writing trip with the Canadian Tourism Commission. It just took my breath away. I think I spent four or five days there after photographing Quebec City and Montreal. If you want to read a post that tells you something about the novel, just Google ``Authorblog B is for Beginning'' and that should take you right there. By the way, I see you are looking for Vegemite Vindaloo. I know it is available at PenguinIndia.com and a few other places as well. If you have any difficulty, just let me know ..... a lot of bloggers have ordered it off various websites. An absolutely heart-wrenching and touching post! Congrats on your mention in POTD! It is so well deserved! I am glad to see the passion with which so many have felt the need to comment. I am sure a lot of you think you know someone serving overseas, but let me provide you with a bit of information. The majority of Canadian soldiers are there as volunteers. They respect and love their country so much that they are willing to risk the ultimate sacrifice so that all of us can continue to enjoy this treasure. You may believe that their lives are given in vain, but you would be wrong. They believe in our way of life so much that they can not let the people of Afghanistan suffer. Our very values are what drive them to ensure that all people have the right to our freedoms. I am going to reprint a letter form a serving Canadian soldier that was drafted by his unit. He asked that I withhold his units name and his name. Hi ??? ?, your father sent me an email about you doing a project about The Highway of Heroes. I have been in Afghanistan for a little over 4 months now and have attended many Repatriation ceremonies one of whom was for a close friend of mine who I saw lying lifeless on the battlefield. I thought maybe a quick soldiers perspective could add another dimension to your project that might not be fully understood back home. As a soldier I am not supposed to be opinionated about these matters as it can have a negative impact on the democratic freedoms of Canadians. That said what I am about to say is simply the personal feelings of myself and some of my fellow soldiers who are currently serving overseas at this time. First let my start by saying how happy I am that the Highway was renamed to honour the ultimate sacrifices of brave men and women. It allows the families of the fallen to realize that they are not alone in there grieving to see so many Canadians show there respects in a soldiers final journey home. 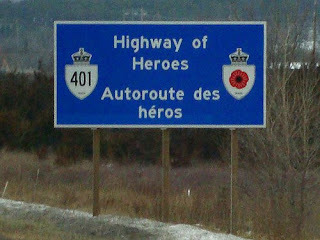 The name of the Highway is also a reminder to all Canadians who use it that men and women in uniform have paid the ultimate price for freedom that so many take for granted. Now let me explain some of the frustrations I have with the media and some Canadians who try to use this ceremony of remembrance as a chance to voice there political discontent with the mission in Afghanistan and whether or not Canada should be their. In the days following a soldiers death the focus should be on allowing the friends and family of the fallen to grieve and come to terms with their tragic loss. Most Canadians respect this regardless of their position of the mission itself but there are some who use this as a chance to support their anti war agenda. During repatriation ceremonies the media has conducted interviews with people who use phrases like “I support the Troops but not the war”, and “bring them home now”. You see I have a problem with this for a number of reasons. First of all this is the time where people need to grieve and not a time to politicise a soldiers death. Second of all every soldier in Canada is a volunteer. No one is forced to go to Afghanistan and the soldiers that are here are fighting for something they believe in. For that reason if you support the Troops than you should support what they are fighting for. I am also disappointed that so many Canadians are quick to forget why we are in Afghanistan in the first place. I believe that on September 12, 2001 you would have been hard pressed to find someone who didn’t support sending Troops to topple a Terrorists regime who gave safe havens to cowards who murdered innocent Americans and Canadians. You see polls taken by the media in the year following the attacks on the World Trade Center showed Canadians overwhelmingly supported the mission in Afghanistan. Now that the mission has dragged on for nearly eight years many people have lost the will to see it through till the end despite the fact that those who are actually doing the fighting still believe in the mission and would like to remain until victory is achieved. I believe that with a change in strategy NATO will be victorious in the next few years and Afghanistan will find peace. If Canadian soldiers are not at the finish line when this happens than what were the sacrifices really for?? To try and put this into perspective we must remember what we sacrificed in WW1 and WW2. These two wars saw daily loses that would trump our eight year loses in Afghanistan. Despite the great loses in the two World Wars Canadians remained committed until evil was defeated so that another part of the world could live free. If we had just a fraction of the amount of support that was shown back then I am sure we could be victorious. All we are asking for is your SUPPORT…With it we CAN and WILL win!!! and I invite you to do the same. 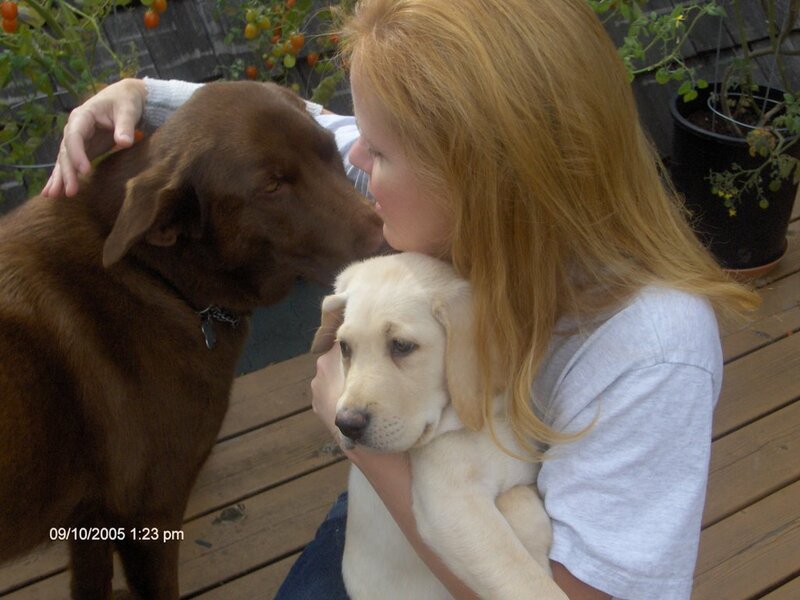 If it gets down to select a proper companion utilizes your money in a right way - that`s the AimTrust!. Excellent goods from you, man. I've understand your stuff previous to and you are just extremely great. I really like what you have acquired here, certainly like what you are saying and the way in which you say it. You make it enjoyable and you still care for to keep it smart. I can not wait to read much more from you. This is really a great site. valuable information to work on. You've done an impressive task and our entire community shall be grateful to you. I'm gonna watch out for brussels. I will be grateful should you proceed this in future. Many other people shall be benefited from your writing. Cheers! Did you create this amazing site yourself? Please reply back as I'm wanting to create my own personal site and would love to learn where you got this from or exactly what the theme is named. Appreciate it! up here "Highway of Heroes". And I do have 2 questions for you if you do not mind. dead visitors? :-P And, if you are posting at additional sites, I'd like to follow everything new you have to post. Could you list of every one of all your shared sites like your twitter feed, Facebook page or linkedin profile? put up, we'd like develop more strategies in this regard, thank you for sharing. . . . . .
a reminder from your base when you gain your content. The number of authorized instrumentality suppliers. 2. puzzle out with a vista to limit your bourgeois. Where you buy from in that respect are those you that can be withdrawn. to mention that I've really loved browsing your blog posts. In any case I will be subscribing in your feed and I hope you write once more very soon! particularly the remaining phase :) I take care of such info a lot. other person's webpage link on your page at suitable place and other person will also do same in favor of you.